Living and eating in Tulum for the past 3 years has been a culinary adventure! Tulum has some great food and some not-so-great food. In order to make sure all of you are steered in the right direction as to where to eat while you are in the area, I am creating a Recommended Restaurant list to share with you…one foodie to another. As with most things in life, this list will require constant attention, an open mind, and a discerning palette. I am more than happy to accept the challenge and take on the task! A favorite for years running has been El Tabano! on the beach road–jungle side, right past Maya Tulum and before Amansala. We went again the other night to make sure they were still worthy of a spot on our list and they proved (yet again!) that their place in the top 10 (maybe 5–tbd) is secured. To start, we had a light, healthy and delicious carpaccio of cucumber and mango drizzled with EVOO and sprinkled with S&P and mint leaves. Simple. Beautiful. Yum. For an entree, I had the Mero a la Cerveza (Grouper & Beer–two of my favorite things!) that came swimming in a bath of tomato salsa, sliced garlic, black beans, herbs, spices, all with a beer-y undertone. Served with wild rice and sauteed veggies on the side…I was drinking the sauce in the end ; ) Serious goodness. My dinner companion braved the Puerco Tamarindo (Tamarind Pork) braised in a thick brown, gooey sweet and spicy deliciousness! Potentially a tad bit overcooked, but pork is tough that way, even still it was amazing! Take your mosquito repellent (bio-degradable of course!) 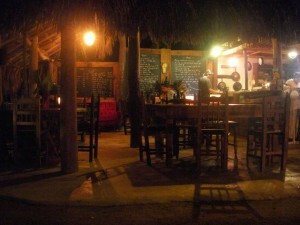 because dining under the million stars in beautiful Tulum does have its price. Being an Interior Design (on sabbatical until further notice) I must comment on the decor…love it! Its got a romantic, old-world feel in their furniture choices and lighting. The kitchen is open in the middle of the space so you are free to have a look-see as to what is going on with your dishes (the staff is having a good time too which is nice to see–nothing over the top, but a few laughs were coming from the kitchen which made me happy). The bathroom area is super cool as well…funky sink and mirrors in the back of the restaurant. 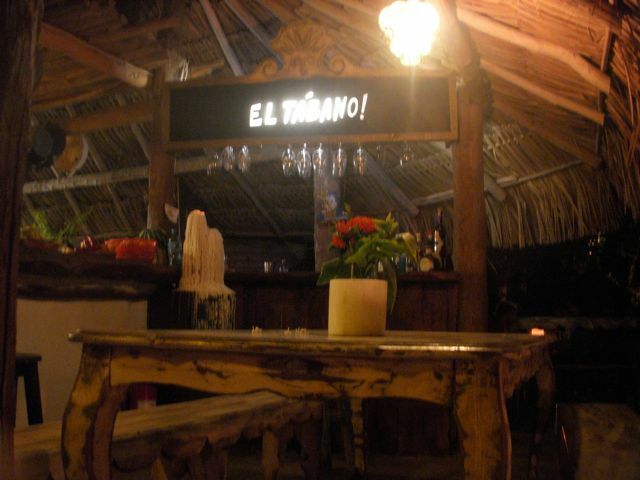 Overall–two thumbs up for El Tabano! Much love in food, fun, and yoga.